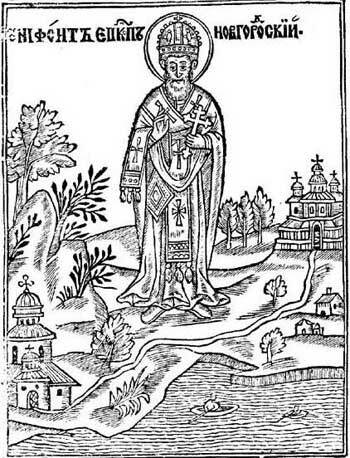 Saint Niphon was a monk of the Kiev Caves Monastry, where he struggled in asceticism. In imitation of the Holy Fathers, he uprooted the passions through fasting, vigil, and prayer, and adorned himself with every virtue. He was chosen as Bishop of Novgorod when Bishop John retired to a monastery after twenty-five years of episcopal service. Saint Niphon was consecrated bishop in Kiev by Metropolitan Michael and other hierarchs. Saint Niphon embraced his archpastoral duties with great zeal, strengthening his flock in the Orthodox Faith, and striving to prevent them from becoming separated from the Church, which is the same as being separated from Christ Himself. He instructed his flock in the law of God, preaching to them, reproving, rebuking, and exhorting them patiently and with sound doctrine (2 Timothy 4:2) so that they might obtain the salvation which is in Christ Jesus with eternal glory (2 Timothy 2:10). At a council of bishops, Saint Niphon declared that he would not approve the consecration without the permission of the Patriarch of Constantinople. He reminded the other bishops that this was contrary to the tradition of the Russian Church, for Russia had received the Orthodox Faith from Constantinople. Starting in 1448, however, the Russian Church began to elect its own primate without seeking confirmation from Constantinople. Saint Niphon again took up residence in the Kiev Caves Monastery, where he became ill. Thirteen days before his death, he revealed to the brethren that he had had a wondrous dream. Saint Theodosius (May 3) appeared to him and announced his imminet departure from this world. Saint Niphon reposed in peace on April 8, 1156. Now he stands before the throne of God, interceding for us before the All-Holy Trinity, to Whom be all glory, honor, and worship forever.